May is one of the heaviest months of bookflow into my home (the other two are July, when I attend Readercon, and October). The semi-annual Friends of the Library Booksale takes place through the weekends of the month, and as classes end at the two colleges students prepare to leave and, in some cases with great sadness, get rid of their libraries as they jet across the globe to return home. 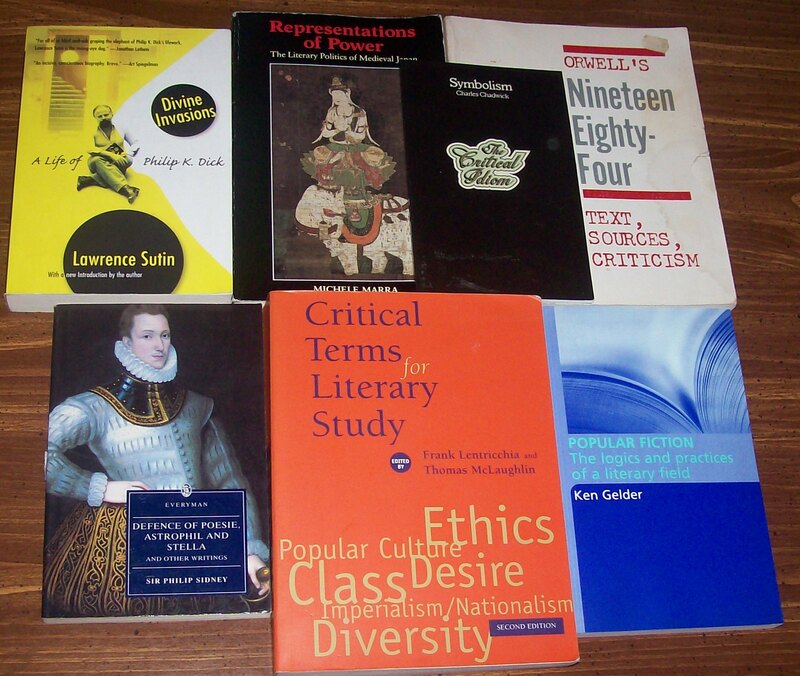 This gives me access to a curious bounty of books, particularly in areas such as fiction and academic literature. 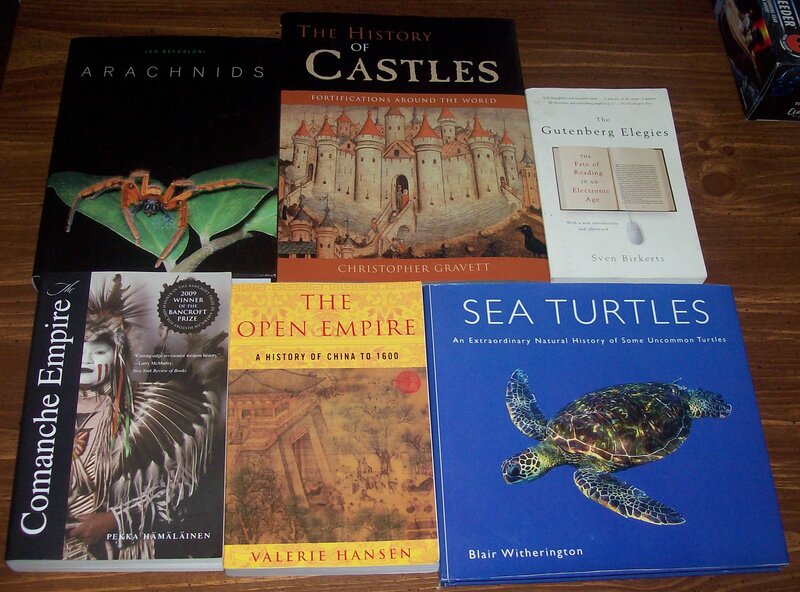 The great thing about this month is that I can not only get good books, I can discover a wide variety of them. Here is the first taste of that variety. 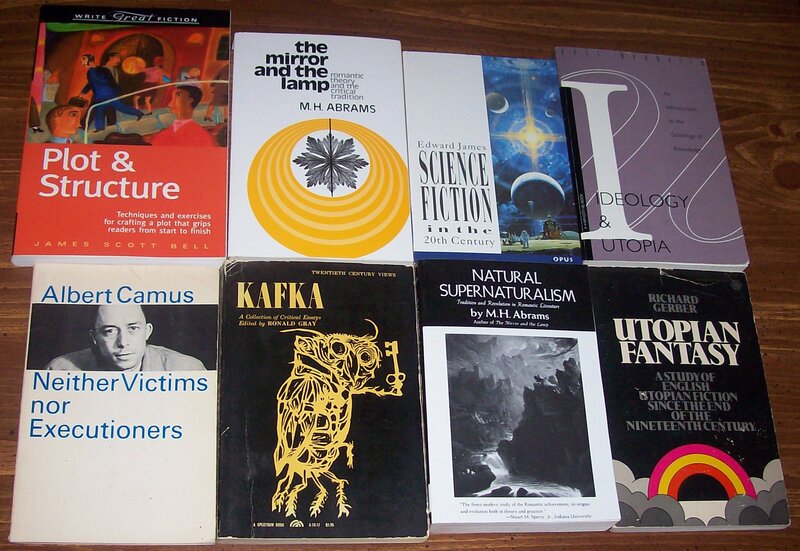 Most of these books are about forms of magical thinking. The two that aren’t are about history and experience. I found Enduring War on our dollar cart, put there by one of my colleagues. I’ve read a bit of it and it promises to be a powerful collection of stories, not just because it is about war but because it is about surviving war, trying to make sense of it in the moment and in the aftermath. Most of the other books seem to be the antithesis of it, about fantasy and other worlds and ways. A Short History of Dublin is a crisp, no-nonsense rendering of the great city’s story. And yet, it cannot help but raise up its subject and smooth out the roughness and contingency of the city’s history. 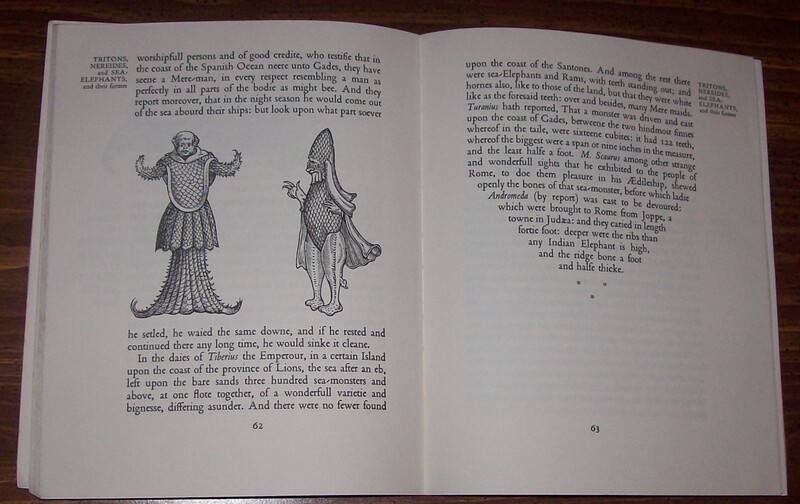 Here is a sample page from The Elizabethan Zoo, which is a charming book that delightfully blurs reality and fantasy. I love the illustrations, particularly of these two merfolk, who look as if they would not be out of place at court with their regal demeanor. 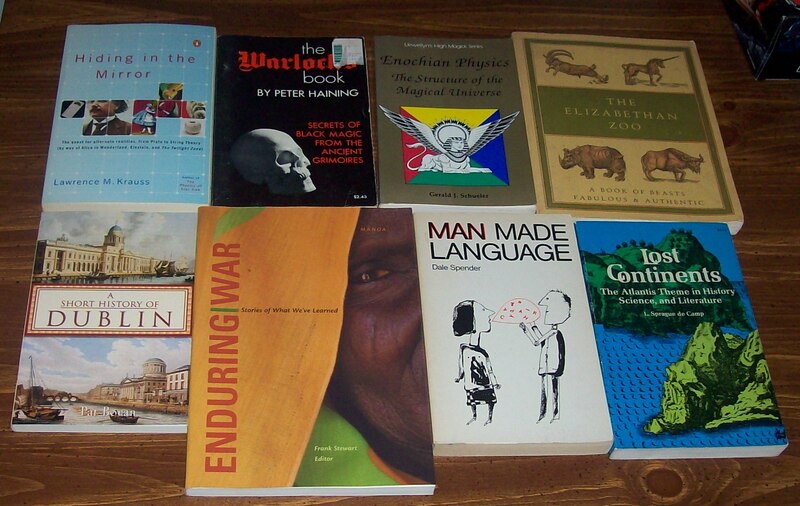 Here we have an array of histories. The two books on Prehistoric Europe have a nice mix of technical and narrative information. The Spanish Civil War: A History in Pictures is a treasury of photographs that humanize the conflict and its history. The book on boats is an odd book for me, but it is both interesting for the history and for its highly-detailed discussions of boat construction and use. The other two books are about empire: one about living in its margins, the other about trying to throw off its rule. Of course, the latter book is about Freemasonry and “the battle for the New World” so I wonder how much veracity the story has. Yet, I am always fascinated with attempts to fold conspiracy theories into the telling of history as people look for a narrative that makes more sense to them. A bit more history, in the form of a nice, although not very deep, history of castles (which is very Eurocentric, sadly). Two more books on empires of very different sorts, both of them attempts at fresh examinations of their subjects. 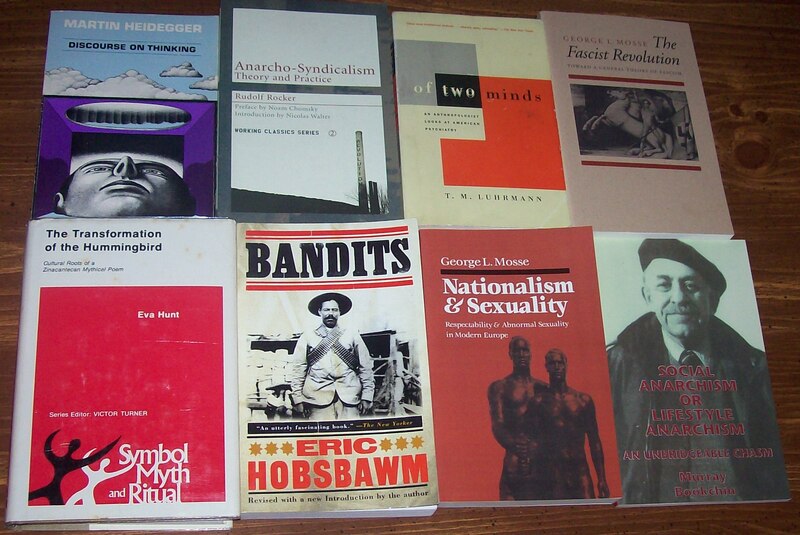 I am intrigued by each one’s thesis, especially by the book on the Comanches. The other two books are natural history, one dealing with my favorite animals, the other dealing with one that many people fear, but that are amazing creatures. 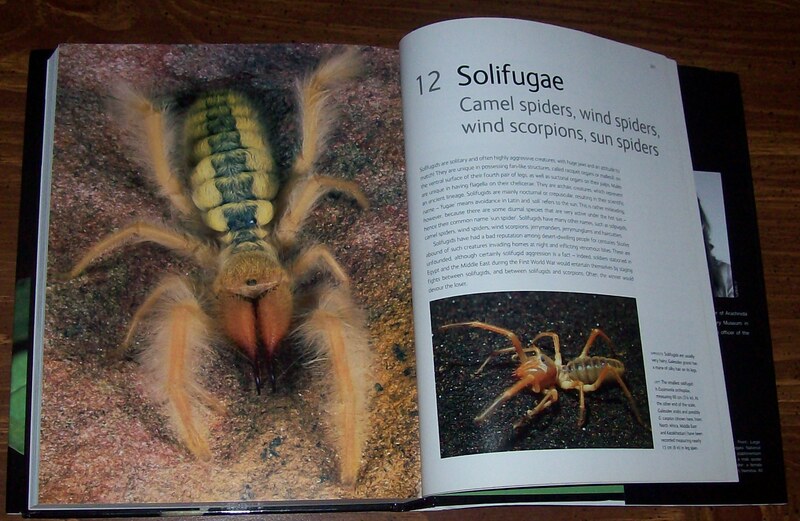 Here is a sample of the illustrations for Arachnids. The pictures are excellent and the book’s text is dense and informative. This is the May crop of books on reading. The Manguel is an upgrade from the softcover that I own. 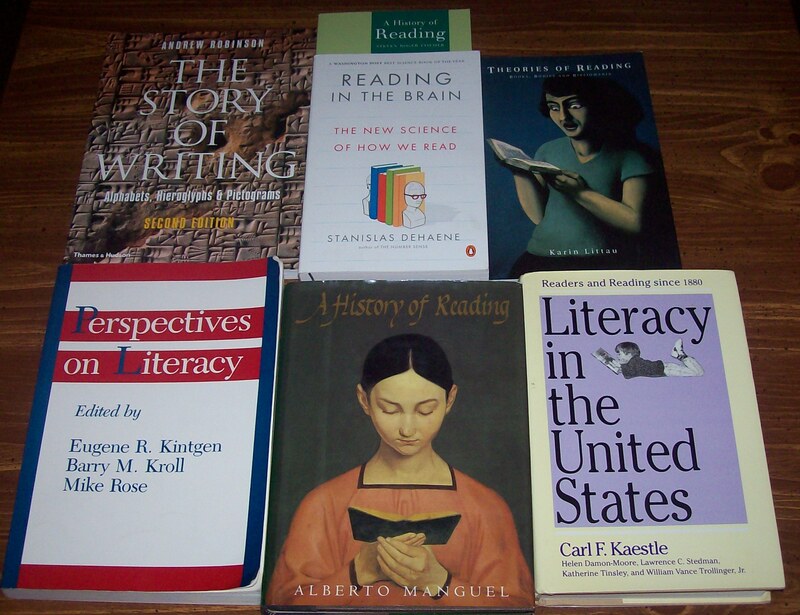 The two books on literacy will hopefully answer some questions I have about the subject. The Dehaene is pretty good, if rather narrow in its focus. I have skipped through Theories of Reading and it needs a closer read, but it has given me a lot to think about in terms of how the practice of reading is considered. One of the challenges I have found in writing about reading is that creating a generalized reader is always problematic. You’re really just creating your own reading of how you think others read, of what reading is all about. I am hoping that the more information I garner and the more thought I put into it, the better my reading will be. Now we cross the border more boldly into the Realms of Theory. The Luxemburg and Anderson titles are classics, although the latter is a revised edition. The Gadamer is also a classic, sadly with a lot of underlining, but I am curious to learn more about his take on the subject. 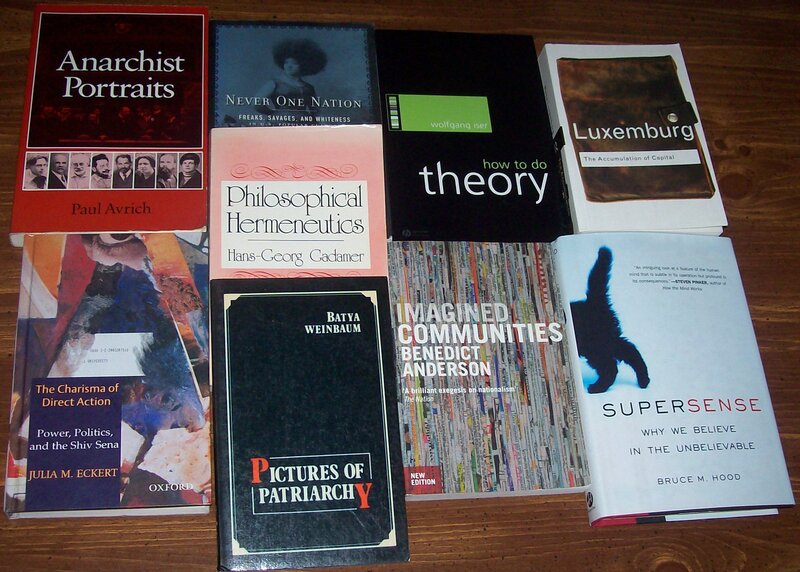 The Iser will hopefully be enlightening about the topic, but I worry that it will be too “practical.” The other books are all focused on fascinating topics, like anarchism and identity and how we think. More anarchism shows up here. I have never read any Rocker but I have read some Bookchin, and I’m curious to see how he makes the distinction in his title, as it has undergirded some of his other writings. I have never read Mosse either but we were sold most of his books and these two caught my attention. The bits I have read make me want to read more. I have never actually read Heidegger, just interpretations and applications of his idea, so that book will be a bit of an adventure. Hobsbawm is always thought-provoking and the Transformation of the Hummingbird was recommended to me several times in graduate school. 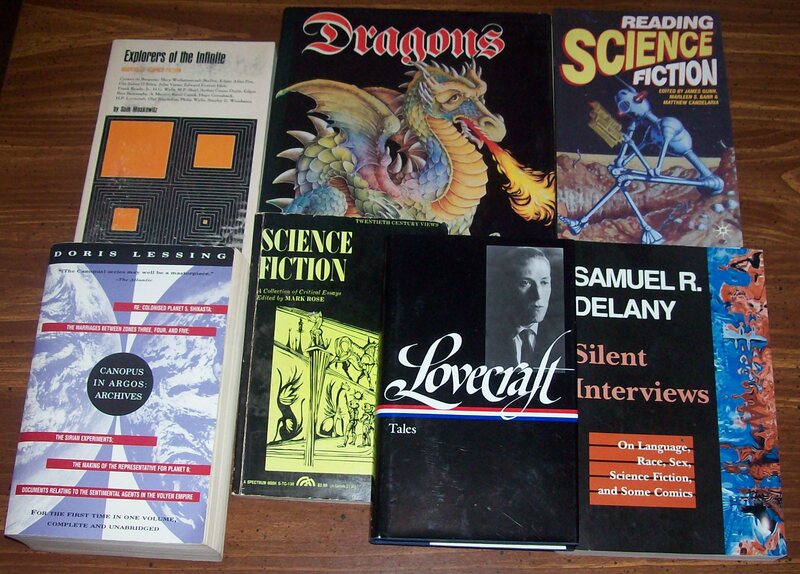 All of these books are novel explorations for me. Now we move into the realm of literature. The book on the folklore in ballads looks quite enjoyable, as is the Hurston, which I’ve read but did not own. The Auden is an early printing and the Sartre may be the first printing for the publisher, both books full of interesting essays to explore. The Everyman edition combines two works I have wanted to read for sometime, and I look forward to reading them together. The book that is standing up is a first American edition (sadly without jacket) of Virginia Woolf’s The Captain’s Death Bed and Other Essays. These books are full of great short writings. 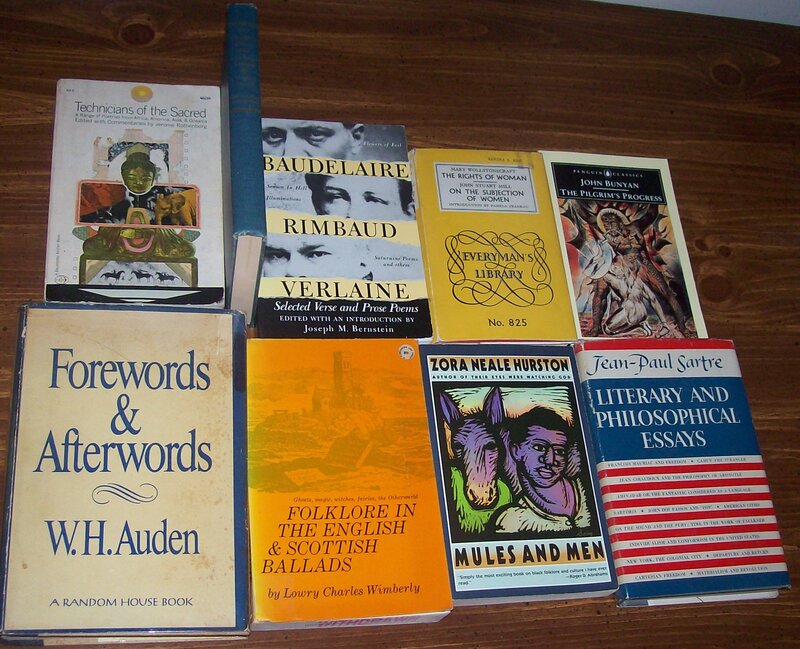 More literature, a mixture of fiction and not-fiction. 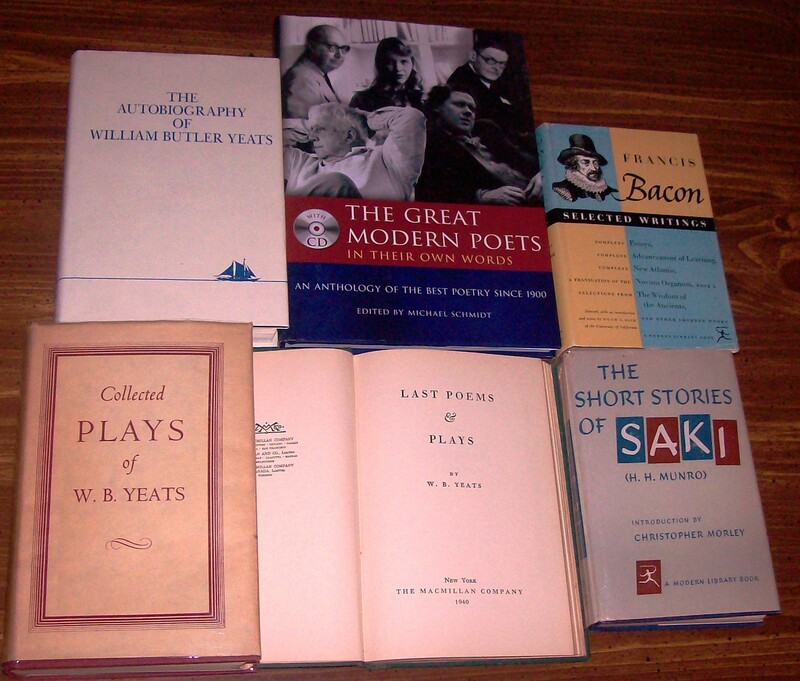 I found several volumes of Yeats, a few nice Modern Library editions, and a book of poetry with a CD of the poets reading their work. And now we begin our descent into Terra Ficta. The Dacre and Brown are for my growing Gothic collection. I have read the McCarthys before but don’t own copies. I have not read the Acker or Morrison, and have read too little of both authors. The Oyeyemi was a surprise gift. The Le Guin is a second printing of the first edition with lovely illustrations, but it ex-library. But it’s former home was the Willard Straight Browsing Library at Cornell, and I have fond memories of that place, so I thought it was a nice addition to my library. Lots of fiction this month. 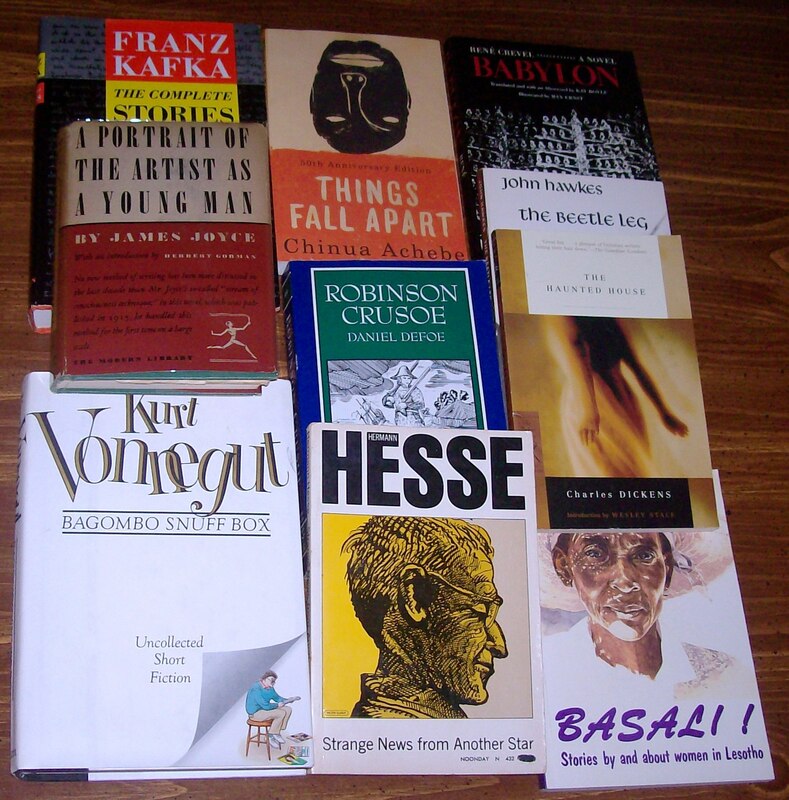 Some are books I have read that I am upgrading or replacing, like the Achebe and the Joyce. I don’t know much about the Crevel or the Hawkes but I read a few pages of each and I was intrigued. Basali! is a book from South Africa of stories written by women from LeSotho. I don’t know what to expect from it but it seemed like a rare opportunity to read stories from a place I know little about. A side trip into the gardens of literary criticism and history. The PKD bio I am reading as I go through his Exegesis, and the book on popular fiction is for my book project. The one on Japanese literary politics just sounded too good to pass up. The 1984 text is beat up but it has a good roundup of reactions to the book. The rest is much more literary-critical material. And some more. The Modernity/Modernism issue contains an article on H.P. Lovecraft’s work. 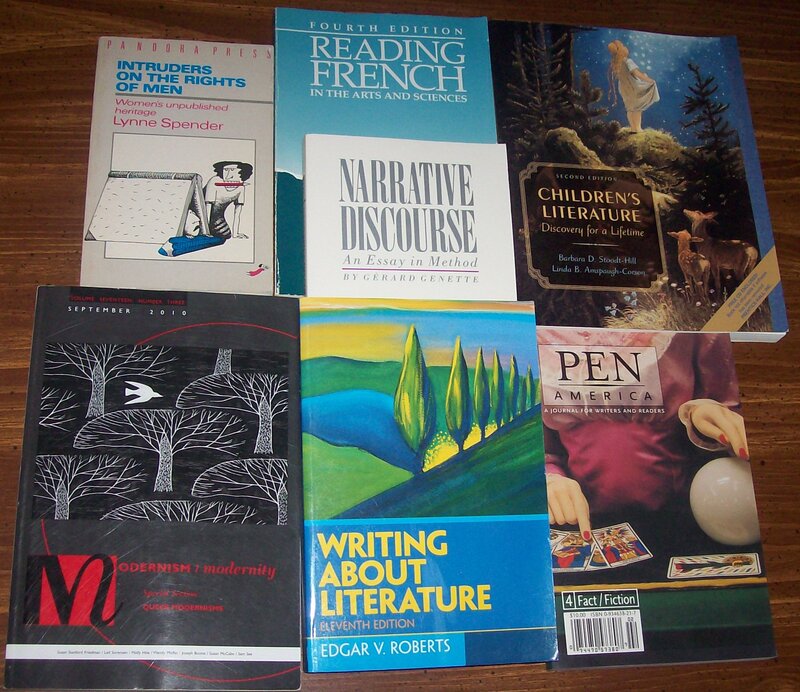 The Reading French is an older edition but I have been trying to read some poetry and short writing in French recently and I would really like to brush up on it. I picked up the Spender to see how it does or does not resonate with Joanna Russ’ How to Suppress Women’s Writing. More criticism. 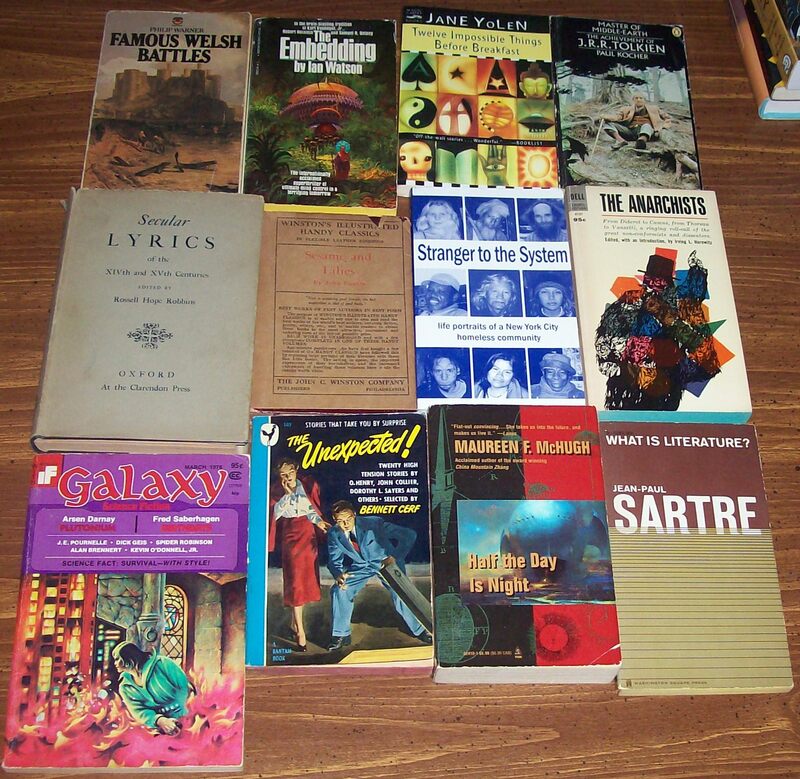 The books on fantastika (in this photo and the next) were all next to each other on the shelf at the Book Sale, and I had to take them home. The two Abrams books were just beneath them, and both come highly recommended by a literary scholar who frequents my bookstore. The Plot & Structure book is probably not a permanent addition, but I find myself stuck on plot often so I am hoping that a little extra reading about it will give me some ideas to work with. The Camus is more philosophy, I suppose, but is a great piece of critical writing too. More fantastika criticism, and a book on dragons. The Lovecraft collection is a duplicate but for the price well worth picking up. The funny thing about that one is that I found it in the Folklore section at the Book Sale. Such mis-shelvings do happen a lot there; I also found Yeats’ autobiography in Mythology. The Delany I have already read a few sections of, and as always it is inspiring. And now for something completely weird. I obtained a hardcover copy of The Weird and now own the book in all major formats. It is both that good and that infectious. 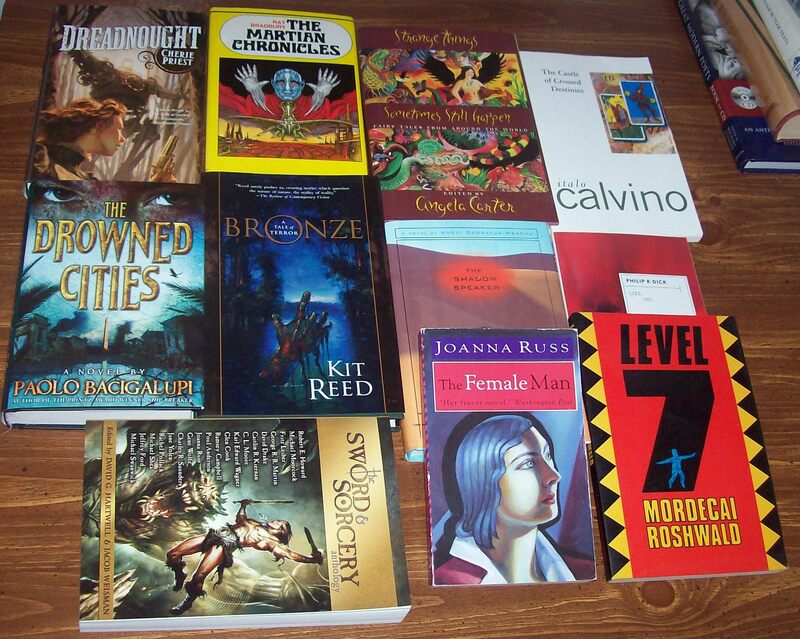 The books surrounding it were the fruit of a Night Shade Books sale and two of them are soon to be read. I have already read The Weird through once and gone back to a number of stories. 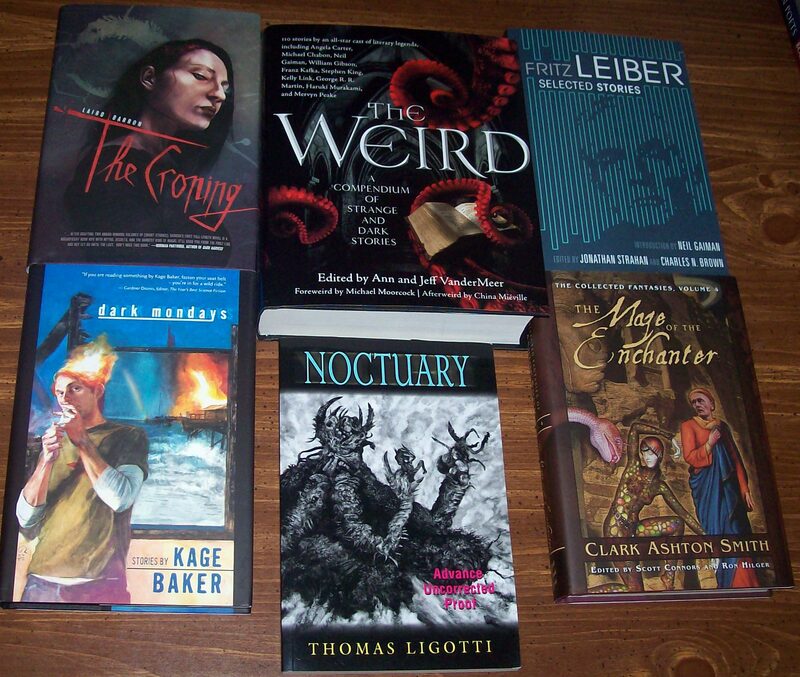 Along with these books I have my ARC of Thomas Ligotti’s Noctuary, which I finished recently for review at SF Signal. It’s quite a book, not for the faint of heart or soul. These are the sort of books that make me really happy. More fantastika. The Russ is an edition that I do not own, from the UK. I had never heard of Level 7 before but it sounds right up my dystopian alley (which is poorly built, full of dead ends, and full of dissidents hiding from the state). The Bradbury was a lark; I have an odd fondness for old SFBC editions. I am curious to read Bronze because it is missing the last four lines and I wonder how that will hit me in the end. 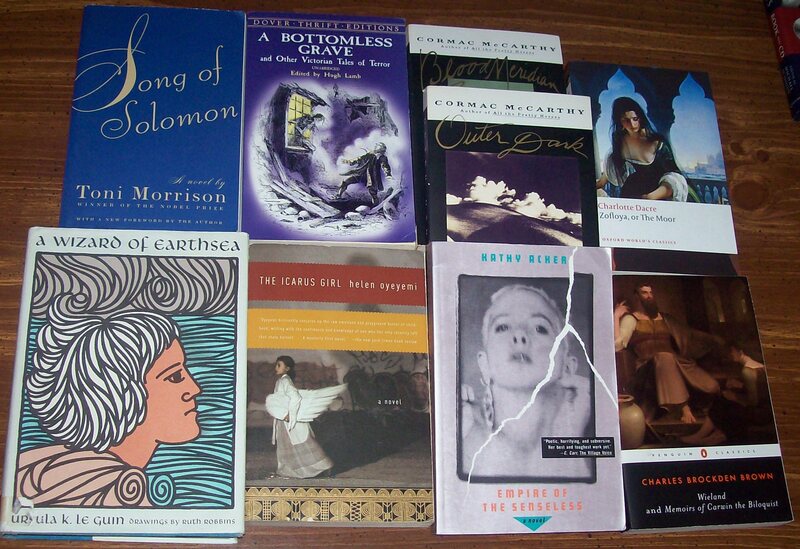 A lovely bouquet of fantastic fiction. And here we have a photo of books grouped together because of their small size. The book of secular lyrics of the 14th and 15th centuries seemed like quite a curiosity, but it contains some wonderful stuff. The Ruskin was abandoned and it seemed like a good moment to obtain one of his books. 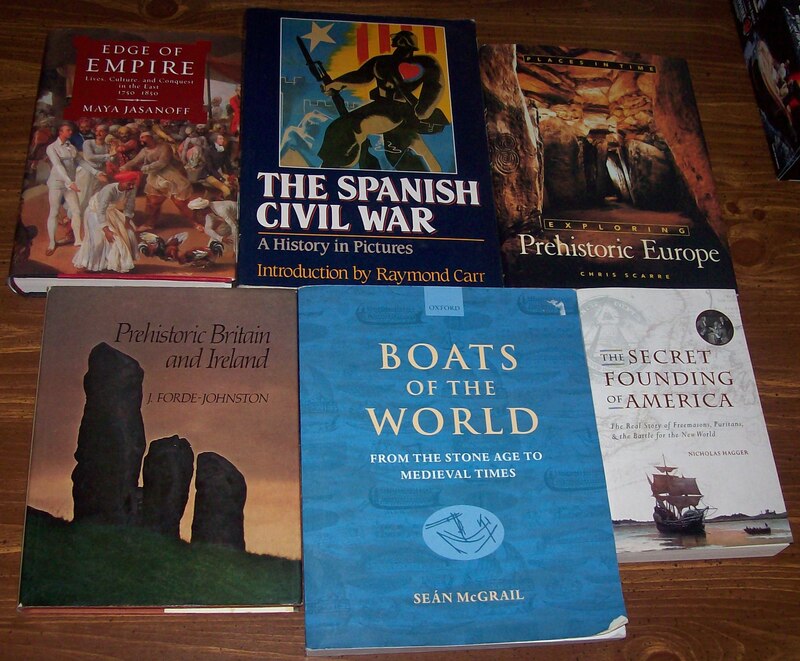 There are fictions and life-stories and ruminations on literature and history, a nice reflection of the variety of books I acquired this month. I was happy to see a copy of the original edition of Whale Rider come into the store; it’s hard to find and I think my daughter will love the story. 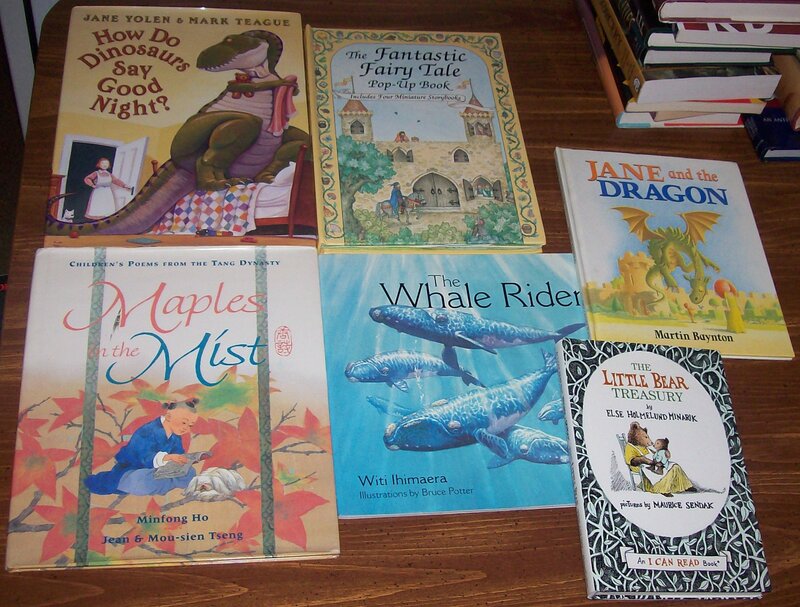 The same for the Jane Yolen book, which is more her speed at the moment. She has already been read Jane and the Dragon and she was quite taken with it. I don’t know how she will respond to the Chinese poetry, but I am trying to build a diverse library for her, and this fit the bill. The Little Bear Treasury was an impulse buy after I saw a young boy sit in our bookstore and read it for an hour, impervious to the world around him (and quite sad when the adult with him would not buy it). 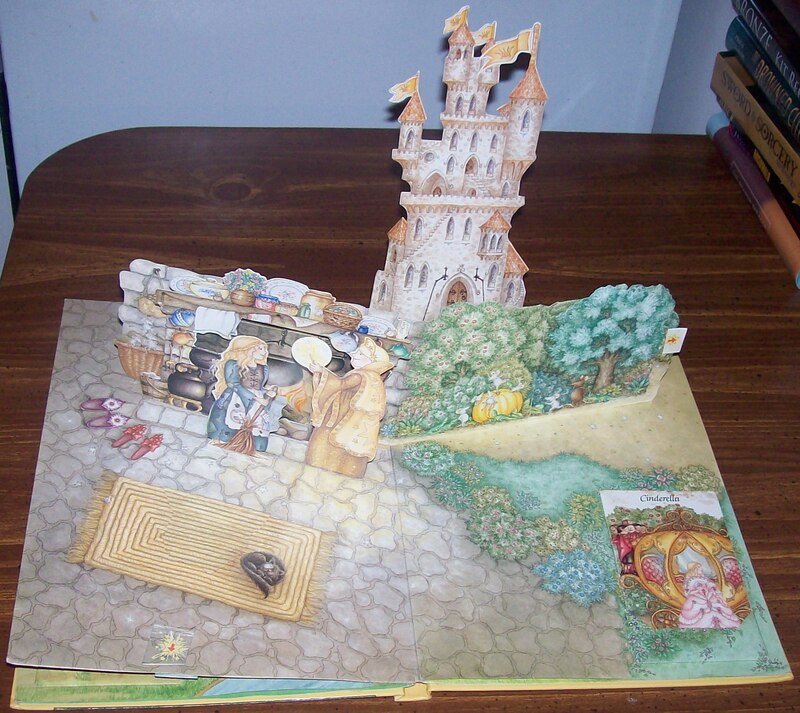 As for the pop-up book, it is missing two of its mini-storybooks so the seller just gave it to me, and it now joins a growing collection of hurt pop-ups that I let my daughter play with so that she can learn to treat them, and all books, well. 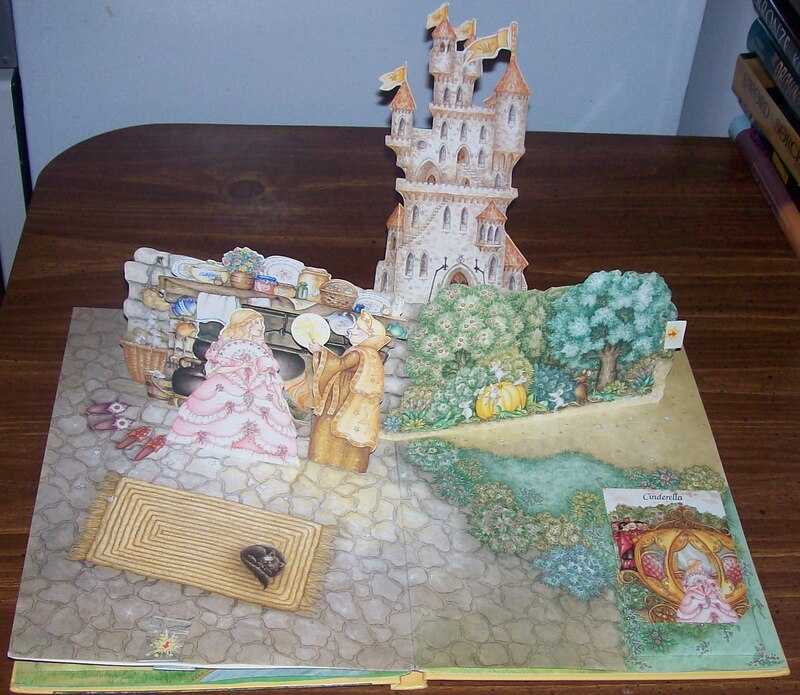 Pop-up books are wondrous things when done well. They are such a distinctive fusion of visual art and book-feel and I have very happy memories of them from childhood, although the ones I played with were pretty simple. So far my daughter loves them, although she has ruined a few in her zeal to make them work. But I am teaching her how to use them gently, and she is learning. This is her favorite scene in the Fairytale book, and it’s simple genius lies in Cinderella’s tranformation. Here is the cinder-girl before. . .
. . . and after her fairy godmother spruces her up for the ball. A panel that you might be able to see in the previous photo can pop up to make the change. It’s not some sophisticated feat of engineering, just a clever use of the book itself. We’re still working on the story, which she does not really grasp yet, but she thinks the transformation is great. Her fairy dolls often come to “rescue” Cinderella from her transformation. Like I said, her take on the story is evolving. . . .
And on that note, I will end by talking up my latest publication: my essay on J. M. McDermott’s work is now available in BULL SPEC #7, which you can purchase here. I really enjoyed writing it and exploring his fiction, and I hope that readers enjoy reading about what I found in it.